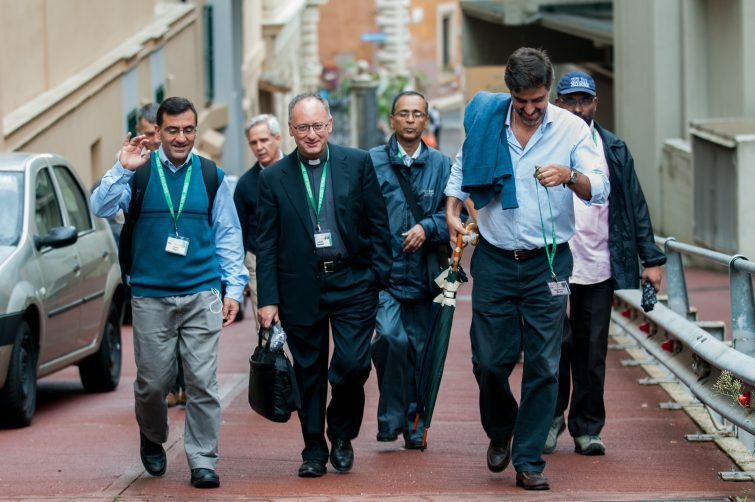 All the members of General Congregation 36 and the support staff are hosted in the various communities of the Jesuit institutions in Rome. A similar arrangement was done for General Congregation 35. A total of 246 persons are directly involved with the GC, either as electors or as support staff. They are distributed in the following way: 91 at the Curia Generalizia, 50 at the Collegio S. Roberto Bellarmino, 38 at the Pontificia Università Gregoriana, 24 at the Residenza S. Pietro Canisio plus 11 in the Bastione the Guest Wing of Residenza S. Pietro Canisio, 8 at the Pontificio Istituto Biblico, 7 at the Pontificio Istituto Orientale, 5 at la Civiltà Cattolica, 5 at the Pontificio Collegio Russicum, 2 in the residence of the Gesù-Astalli, 2 at the Residenza S. Andrea Quirinale, 2 at the Residenza S. Ignazio, and 1 at the Collegio Internazionale del Gesù. The fact that a large number of the delegates are living a certain distance from the curia and the aula had an influence determining the daily schedule. With very few exceptions, all the meals are taken where the Jesuits have their room. It would not have been possible for the kitchen of the General Curia to cook for all participants and staff every day. It means that some people have to walk (or take the bus) at midday for their lunch and come back to the curia before 3:15. It might be good for their health, but it is also quite demanding. On the other hand, it is a great opportunity to “feel” the life of a Jesuit community in Rome, to talk to Italian Jesuits or to Jesuit students from all over the world. We interviewed a few of those “commuters”.